Our 4-tier beautiful Chinese fire wood with step design plant stand is nice looking and attractive. It is perfect for place your favorite plants, books, and decorate your patio, living room or garden. This stand has a really beautiful appearance and is very useful. Made of sturdy and durable Chinese fire wood, the natural wood fragrance is also good for health. Solid wood rack contemporary and stylish design is exactly the right combination for your home. Are you interested in our corner plant stand? Come and buy it! Wood Step Design Plant Stand, Suitable for home use. Solid Chinese fire wood construction, durable and healthy. ❃4-Tier Plant Stand: Giantex 4-tier beautiful Chinese fire wood with step design plant stand is nice looking and attractive. It is perfect for place your favorite plants, books, and decorate your patio, living room or garden. ❃Last Long Using: Made of sturdy and durable Chinese fire wood, the natural wood fragrance is also good for health. Solid wood rack contemporary and stylish design is exactly the right combination for your home. 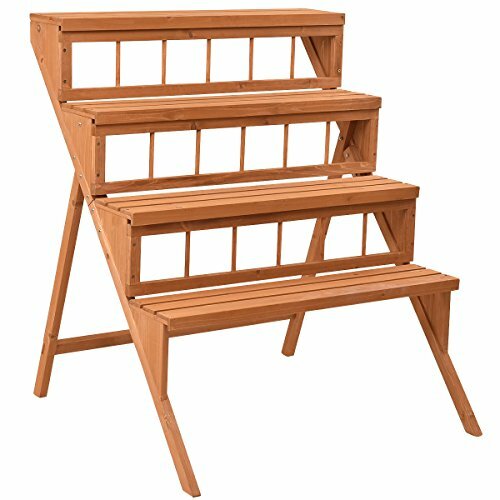 ❃Enough Storage Space: Come with 4 step tiers plant stand, enough wide shelf space could holds several large and heavy plants, suitable for holding and displaying potted plants, shoes, bags and favorite decorations. ❃Convenient To Clean: Yellow water-based paint on the surface will make you more easier clean the dirty. A great home and garden décor plant stand. ❃Easy To Assemble: Come with assembly materials and screws, could easy assemble according to the clear instruction, and if you have any problem, you could contact us by the email. Our nice customer service will reply to you within 24 hours.